When you write a paper on the negative effects of illegal immigration, you have your opportunity to voice your opinion on any controversial issue. Part of the challenge with this essay is that you cannot use a cliché topic; your task is to come up with something controversial other than abortion, euthanasia, and school prayer. You must try to convince your reader that your view is correct without allowing your bias to overshadow your message. You cannot use abortion or euthanasia. You must have an arguable thesis. (In order for your thesis to be arguable, you may want to begin with because or although. You must have at least four sources to support your stance and at least one that refutes your stance. You must use specific examples and direct quotations from each source. You must include in-text citations in your essay. You must include a works-cited page that lists every source used in your essay. Introduce the issue that you have chosen to argue. YOUR THESIS should be a statement that tells what you are going to prove to be wrong about the issue you have chosen. In order to make sure that your thesis is arguable, you might want to begin the sentence with because or although. Each aspect or element of your evaluation should be developed in a paragraph, with a topic sentence, explanation, and specific examples. Offer a well-developed paragraph that reflects all the evidence in your paper. Illegal immigration into the United States. by individuals from Mexico and other Latin American countries has both taxed and benefited all countries involved at different points in time. Additionally, the subject has caused new sources of disagreement between country leaders and lawmakers in Congress. Attempts to find a win-win situation whereby all countries benefit has yet to materialize. United States policies aimed at encouraging and then limiting the migration of cheap labor into the U.S. have been mainly a succession of failures. Available work in the United States and a willingness of immigrants to work for low wages proven that illegal immigrants, specifically those from Mexico, increase the poverty rates of individuals living in the U.S. and reduces the wage rates for unskilled laborers. 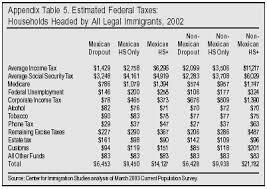 A great majority of Mexican immigrants to the U.S. lack a high school education or professional skills in a given trade (Camarota 6). When these individuals flood the unskilled labor market, the wage level drops for them as well as American born unskilled laborers. During the 1990s, real wages for unskilled American workers dropped by 5 percent, while only reducing prices for consumers by approximately .08 to .2 percent. Paper Masters writes custom research papers on Negative Effects of Illegal Immigration and discuss an example of an order placed for an argumentative paper on immigration.